Examples of decisions on requests for inter partes reexamination for requests filed prior to September 16, 2011 (when the SNQ standard was applied), are provided below. The first example is a grant of an inter partes reexamination. The second example is a denial of an inter partes reexamination. The examiner should leave the paper number blank, since IFW files do not have a paper number. A substantial new question of patentability affecting claims 1-3 of United States Patent Number 9,999,999 to Key is raised by the present request for inter partes reexamination. Extensions of time under 37 CFR 1.136(a) will not be permitted in inter partes reexamination proceedings because the provisions of 37 CFR 1.136 apply only to "an applicant" and not to parties in a reexamination proceeding. Additionally, 35 U.S.C. 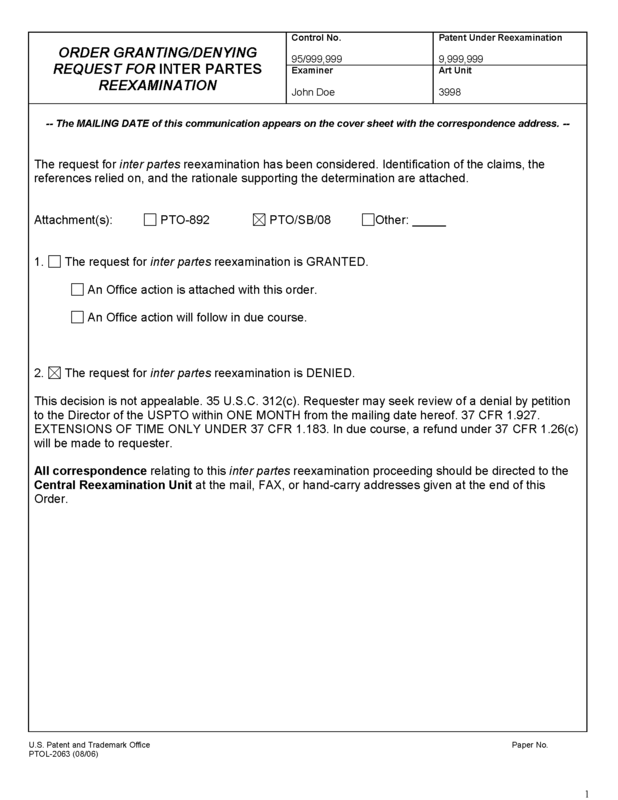 314(c) requires that inter partes reexamination proceedings "will be conducted with special dispatch" (37 CFR 1.937). Patent owner extensions of time in inter partes reexamination proceedings are provided for in 37 CFR 1.956. Extensions of time are not available for third party requester comments, because a comment period of 30 days from service of patent owner’s response is set by statute. 35 U.S.C. 314(b)(3). The patent owner is reminded of the continuing responsibility under 37 CFR 1.985(a), to apprise the Office of any litigation activity, or other prior or concurrent proceeding, involving Patent 9,999,999 throughout the course of this reexamination proceeding. The third party requester is also reminded of the ability to similarly apprise the Office of any such activity or proceeding throughout the course of this reexamination proceeding. See MPEP § 2686 and 2686.04. The request sets forth that the third party requester considers claims 1-3 of the Key patent to be unpatentable over Smith taken with Jones. The request further sets forth that the requester considers claim 4 of the Key patent to be unpatentable over the Horn publication. It is agreed that the consideration of Smith raises a substantial new question of patentability as to claims 1-3 of the Key patent. As pointed out on pages 2-3 of the request, Smith teaches using an extruder supported on springs at a 30 degree angle to the horizontal but does not teach the specific polymer of claims 1-3 which is extruded. The teaching as to spring-supporting the extruder at 30 degrees was not present in the prosecution of the application which became the Key patent. Further, there is a substantial likelihood that a reasonable examiner would consider this teaching important in deciding whether or not the claim is patentable. Accordingly, Smith raises a substantial new question of patentability as to claims 1-3, which question has not been raised in a previous examination of the Key patent. The Horn publication does not raise a new question of patentability as to claim 4 because its teaching as to the extrusion die is a substantial equivalent of the teaching of the die by the Dorn patent which was considered in the prosecution of the application which became the Key patent. Further, the request does not present any other new question of patentability as to claim 4, and none has been found. Accordingly, claim 4 will not be reexamined. 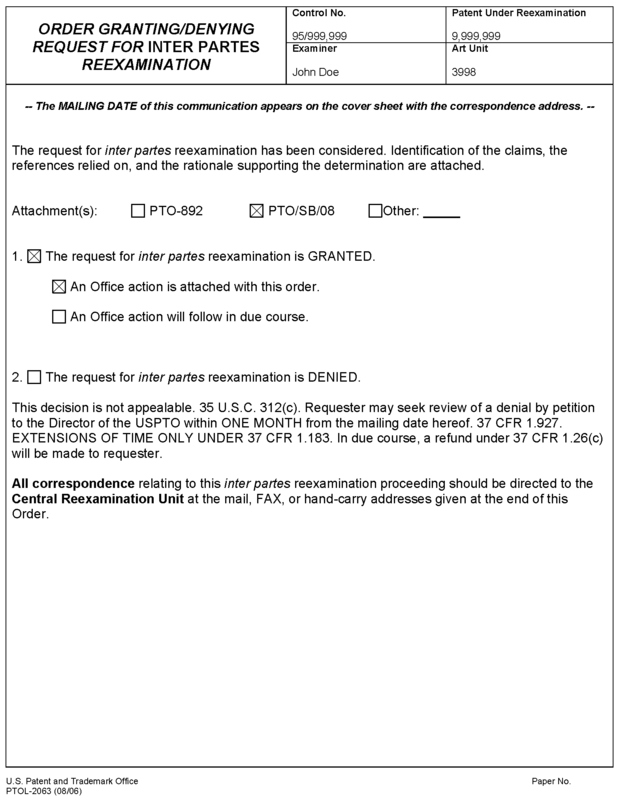 Finally, reexamination has not been requested for claims 5 – 20 of the Key patent. Accordingly, claims 5 – 20 will not be reexamined. Claims 1 – 3 of the Key patent will be reexamined. The request indicates that Requester considers that a substantial new question of patentability is raised as to claims 1-2 of the Key patent (Patent # 9,999,999) based on Smith taken with Jones. The request further indicates that Requester considers that a substantial new question of patentability is raised as to claim 3 of the Key patent based on Smith taken with Jones and when further taken with the Horn publication. The claims of the Key patent, for which reexamination is requested, require that an extruder be supported on springs at an angle of 30 degrees to the horizontal, while a specific chlorinated polymer is extruded through a specific extrusion die. The Smith patent does not raise a substantial new question of patentability as to the Key claims. Smith’s teaching as to the extruder being spring-supported at 30 degrees is a substantial equivalent of the teaching of same by the Dorn patent which was considered in the prosecution of the application which became the Key patent. In the request for reexamination, it is argued that Jones teaches the extrusion die. However, Jones was previously used, in the prosecution of the Key application, to teach the extrusion die. Further, there is no argument in the reexamination request that Jones is being applied in a manner different than it was applied in the prosecution of the Key application. The Horn publication has been argued to show the connection of the support means to the extruder via bolts, as recited in claim 3 of the Key patent. Although this teaching was not provided in the prosecution of the Key application, the teaching would not be considered to be important to a reasonable examiner in deciding whether or not the Key claims are patentable. The references set forth in the request have been considered both alone and in combination. They fail to raise a substantial new question of patentability as to any one of the Key patent claims. In view of the above, the request for reexamination is DENIED.